Looking for a better way to hold up your brand as a home essential? Try ePromos' personalized refrigerator magnets! They're a great way to keep all eyes on your logo. Pass them out at events and trade shows. Give them away with take-out orders. Custom fridge magnets are a great way to attract business by keeping your name and details out in the open for all to see. With a variety of shapes, sizes and customization options, you'll find everything you need to create a unique product with your logo. Imprinted coupon holder with a magnetic strip attached to the back. 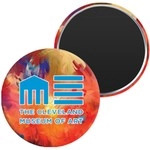 Personalized Refrigerator Magnets & Magnet Clips are a proven promotional marketing staple. Keep your company's details fresh in the minds of employees and clients by giving them promotional fridge magnets. Your logo will be on display for recipients, their families, and guests to see! If you own a restaurant or bar, put a magnet with your business' details in every take-out order as a reminder for next time. If you're looking to create a fun atmosphere, give them an imprint-able set of word magnets to make funny sentences. Promotional fridge magnets are perfect items for businesses that offer emergency 24-hour services. No matter what service or goods you provide, you can turn your customers' refrigerators into your personal billboard even on a low budget. So, start browsing today to find a marketing initiative that will stick in the minds of people, as well as their fridge. Call our brand and graphics specialists to get started!